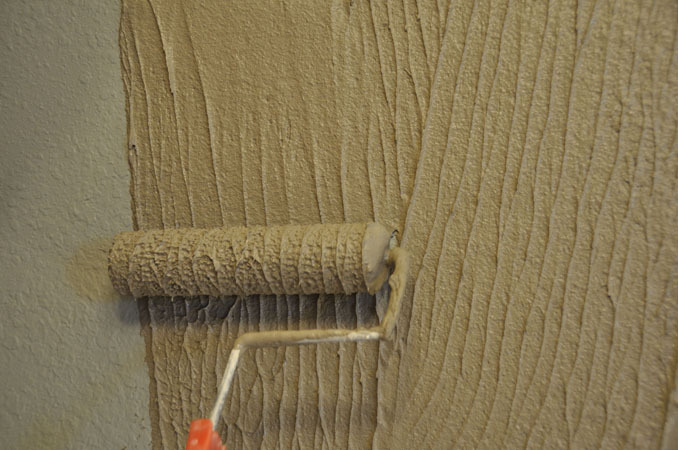 American Clay DIY Game-Changer: Plaster ROLLS-ON w. Up & EZ! Albuquerque, NM (September 2010) – American Clay Enterprises, Inc. has created a game-changer in the world of wall plasters. Message? Throw away that hawk! With the help of the company’s new Up & EZ! binder material, the long-hoped for roll-on application of their celebrated, healthy clay plaster interior finishes is ready for release. Up & EZ! is being shipped to local dealers who have been anticipating the no-VOC, mold resistant and easy-to-use product that continues to contribute up to eight (8) LEED points—along with timeless beauty and creativity—to any project. American Clay can replace paint with this completely reemulsifiable–and therefore repairable—binder that is added to any of the color-integral American Clay premier Legacy products (Loma, Porcelina and Marittimo) to make it a roll-on product, as well as serving as a hardener. Yes, you will still need that trowel, but only once the clay is already rolled on with a 1¼” nap roller. American Clay realized over the years that the process of moving the clay from the hawk to the wall with a trowel can intimidate a typical DIYer. With the new Up & EZ! binder, they had several inexperienced DIYers—who barely had ever painted–test the new roll-on process. In under seven hours, these novices taped walls, rolled on 280 sq ft of LOMA (with Up & EZ! mixed in) in two coats, trowelled back the clay, compressed it, cleaned the roller and trowel, and put the furniture back. They also found that cleaning the clay off the roller was much quicker and easier than with paint, since there is no thick latex binder involved. American Clay is also posting today a “How-To” video on their website and YouTube Channel, downloadable instructions/brochure, examples, as well as pricing on their site (http://americanclay.com/your-diy-info). For dealers/distributors, a sell sheet and MSDS sheet is also available now. The Up & EZ! system keeps the price of American Clay’s Legacy products at $1.00 to $1.45 per square foot, when installed by a DIYer. 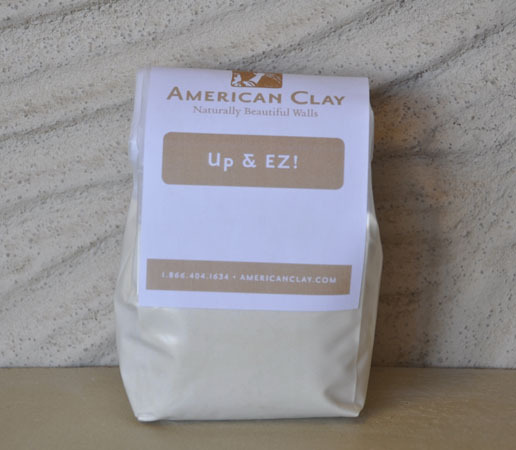 Just like American Clay’s existing product line, Up & EZ! Is suitable for most substrates, making it that much easier for the DIYer to obtain the texture, beauty and comfort of our classic earthen plasters. It will be sold in 1-lb. individual packets, available through American Clay distributors and dealers listed on http://www.americanclay.com. American Clay Enterprises, Inc., based in Albuquerque, NM, produces patented, award-winning, all-natural interior wall finishing products. 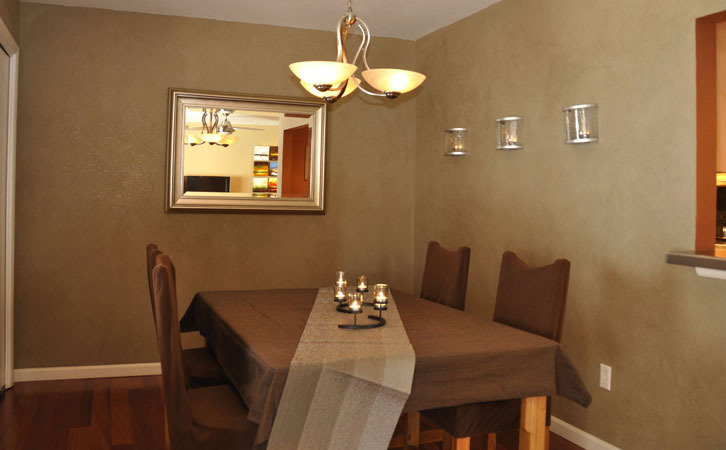 Their Earth Plasters and the commercial ENJARRE single coat plaster are a unique combination of clays, aggregates and natural pigments that offer builders and consumers a natural, elegant and durable option. There is no off-gassing nor inherent waste on-site. The plasters contain no VOCs, are non-flammable, are mold resistant (without toxic fungicides), absorb odors, provide temperature and humidity buffering, repair/clean easily and come in recyclable packaging. American Clay, with an extremely low carbon footprint, is uniquely manufactured in the U.S. and made of materials found in the U.S. The products and various workshops are available through their New Mexico office or through their retailers and distributors across the U.S. For information on products, ordering, technical specifications, product application and additional resources and links: www.americanclay.com. DIYer 'after' shot with Up & EZ! This entry was posted on September 29, 2010 at 7:29 pm and is filed under Business, Green Design / Living, Health, Interior Design, Science. You can follow any responses to this entry through the RSS 2.0 feed. You can leave a response, or trackback from your own site. This product is really awesome ! There is actually no dark point in using it, and I have to mention one more detail about it : since the pigments are coming from the nature, they don’t fade over time..
It’s really great using it, and even better living in it. I’m based in Toronto, Canada, and I started applying it about 4 years ago, and compared to all the products I know from Europe, it is by far the best one. Now I’m professional applier, I do home shows, and my clients are always very glad they found me and this great clay plaster. Now UP&Ez! opens a wide potential for this product, with the ability to roll it on, almost as easily as a paint.